This year sees venerated Melbourne institution La Mama celebrating its fortieth anniversary, and so it is fitting that in honour of this milestone theatre-goers have the chance to see some of the first ever shows staged there, reprised by If Theatre for the occasion. Jack Hibberd is one of Australia’s seminal playwrights, renowned for the enduring classics Dimboola and A Stretch of the Imagination. Before these plays were forged, however, Hibberd worked extensively in the metier of the short play, honing his craft and working his way out of the shadows of his influences. 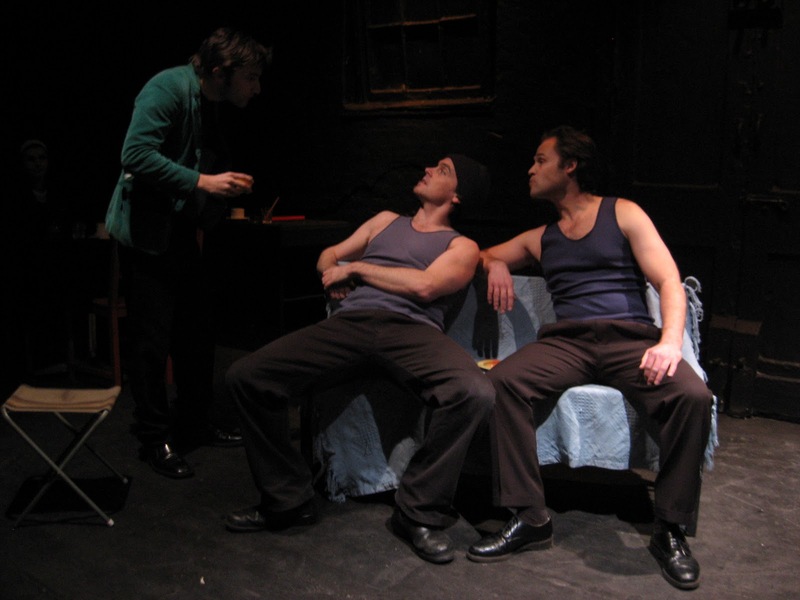 One of these shorts, Three Old Friends, was the play that launched La Mama into the world, and is the first in the current program alongside Before the Honeymoon, and This Great Gap of Time. In many ways, these plays have come home, returning to the close black walls that birthed them. If Theatre, with VCA graduate Matt Scholten at the helm, is quickly establishing itself as a smart and dedicated troupe following its well-received production of Pinter’s A Slight Ache at Chapel off Chapel at the end of June. Their take on Hibberd shows a firm grasp on the material. Three Old Friends is the strongest of the works on offer here, bristling with barely contained menace as the hapless, chain-smoking Steve (Troy Larkin) is circled by the blue-collared sharks Ron and Herb (Glen Hancox and Lawrence Price respectively). It is also in a way the most Pinteresque, with deflection and denial spiralling to a dangerous denoument. Things change gear a little with Before the Honeymoon, a strange carousel of word-gaming and tripping rhythms. A proposal is followed by a denial, and back and forth the lovers (Lou Endicott and Lawrence Price) bat the words to one another in search of where the heart lies. It is clever, but perhaps a little too clever – despite admirable attentiveness from the players, the sadness inherent in the material feels but gently brushed by Scholten, though this may have more to do with Hibberd looking to out-Beckett Beckett. The evening closes with This Great Gap of Time, where staid and stuffy businessman Mr A (Glen Hancox) has his office invaded by a nameless youth intent on general obfuscation. Troy Larkin plays the youth with an airy diffidence that turns to a steely danger in an eye-blink, perfectly juxtaposed by Hancox and his uptight suit. Things take on an air of the sublime as the upstanding gentleman is made to dance the Pride of Erin on point of death. This Great Gap of Time is a great bit of apparent whimsy, hiding beneath its cloak all the fury of the class wars and the ever-present generation-gap. Lighting and sound are minimal, as might be expected, but Bec Etchell here simply serves to subtly highlight the iconic dimensions of the La Mama stage. These are clean, uncluttered takes on the material, and with the total running time clocking in at just on an hour, Three Short Plays is short, sharp theatre that is worthy of its heritage.